I’ve been sick as a dog with cold/flu/upper respiratory infection – again! – for the past week. I’m not sure how this happened since I try so hard to avoid it. I may as well send the grocery cart through the car wash for the thorough wiping down I give it before touching it. Same with doors, gasoline pumps…anything I think could be infected. I apparently need to buy myself a bubble to live in November through April! Or maybe this is payback for my post about my sister, Barf, last week. Who knows? Anyhooooo….my good buddy and neighbor, Barbara, and I pooled our resources a few weeks ago for a fun south-of-the-border girls’ night in. 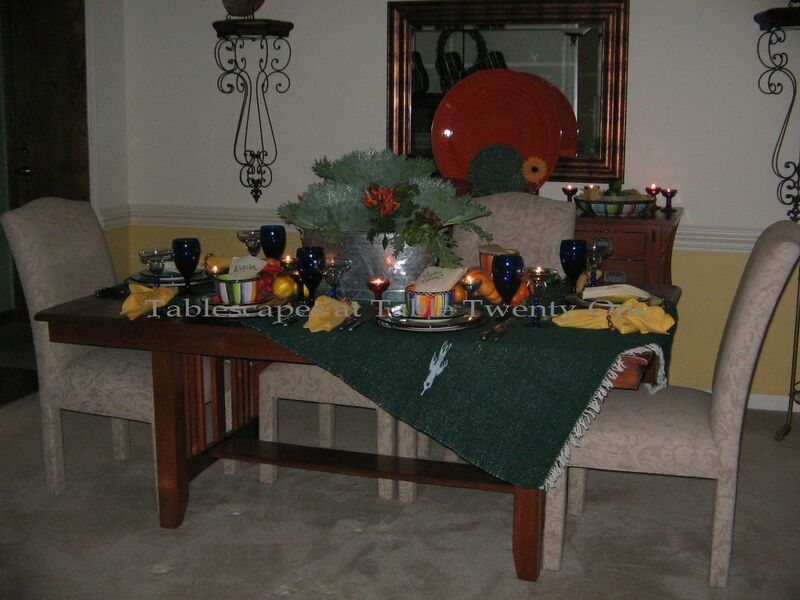 Barbara whipped up wonderful Mexican food – our favorite – so I created a table with a little upscale autumn flair. This would make a great tablescape for Cinco de Mayo, too! 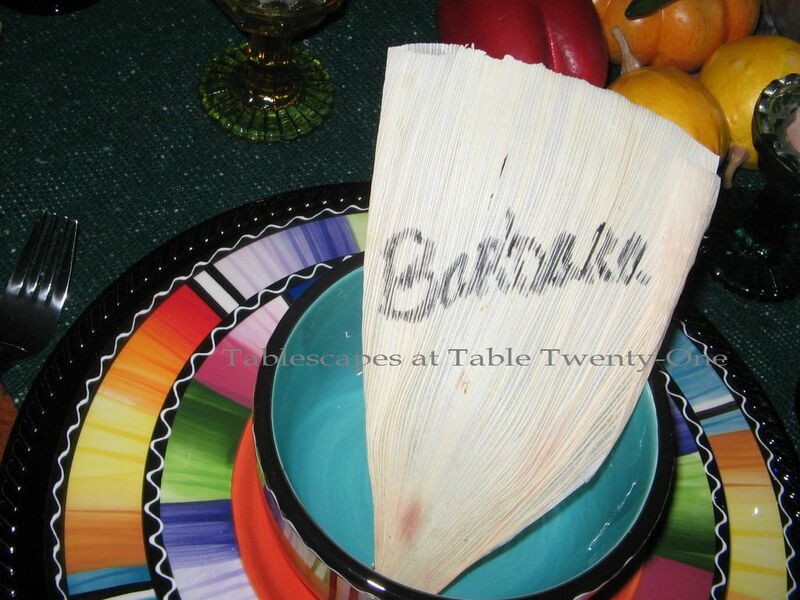 I used store-bought corn husks as place cards. Bright yellow napkins from Bed, Bath & Beyond are cinched with fun wooden bead rings from Pier 1. This “San Remo” flatware worked out much better than I thought it would! It really lent to the “upscale” Mexican feel. Cobalt blue beverage glasses from Pier 1 paired with margarita glasses from Old Time Pottery. 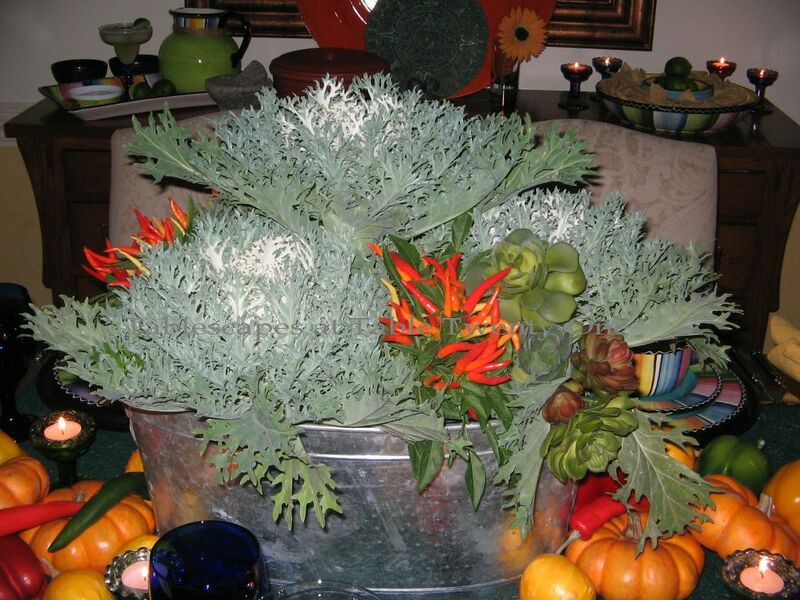 The centerpiece is a profusion of “Peacock White” flowering kale with fronds that remind me of a cactus, “Medusa” ornamental pepper plants, and succulents nestled in a hammered aluminum ice bucket. The nearly all-vegetable centerpiece is extended with various peppers, squashes and pumpkins. The mercury glass-lined raised tealights in gemstone colors are a World Market find. I was so happy to find matching accessory pieces for the dishes including trays, serving bowls and pitchers. 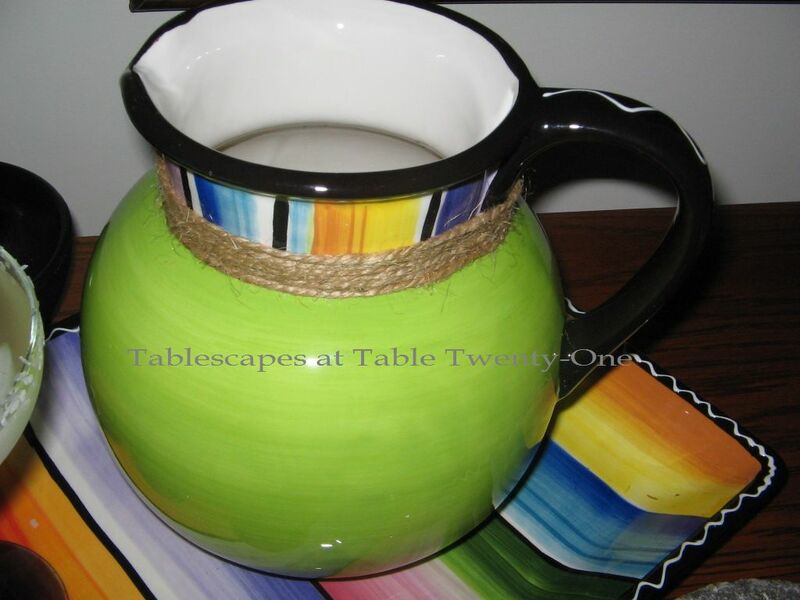 I gave this pitcher of margaritas a more rustic look with the addition of twine wrapped around the neck. The traditional molcajete is another Tijuana treasure that sees a lot of action around here. 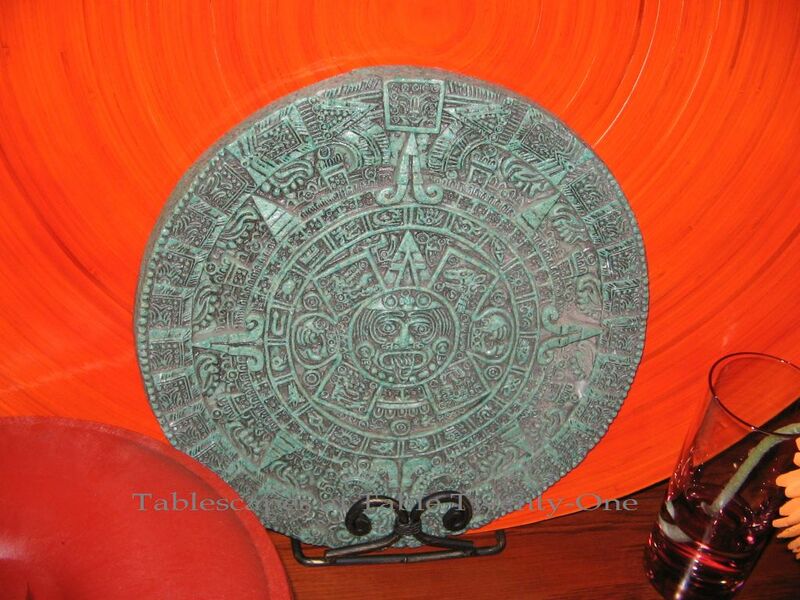 To dress up the buffet, I used one more bit of Tijuana memorabilia – a Mayan calendar – which is backed up by a huge orange platter to add depth, height, and vivid color. I fear I’m going to cough up a lung if I don’t rest now. Hope you enjoyed it! Be sure to join me (if I’m still tickin’ by then!) 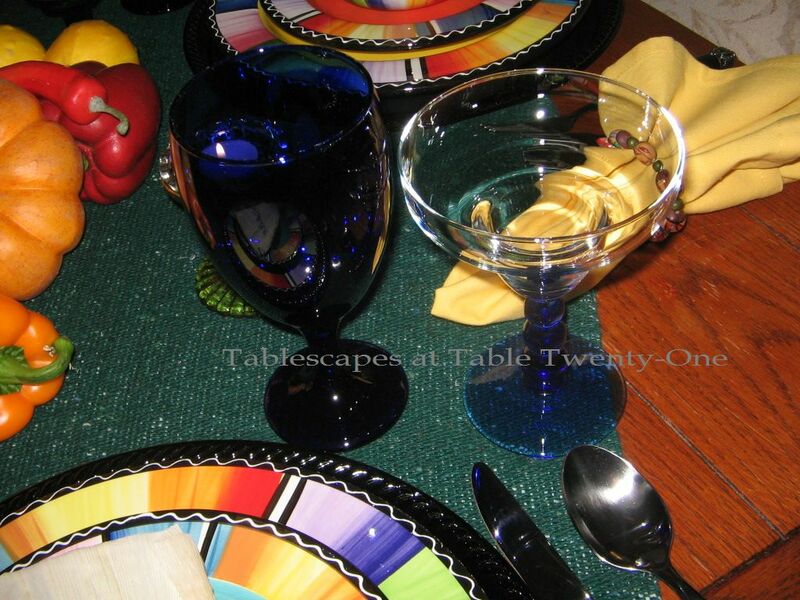 for Susan’s Tablescape Thursday!!! Alycia, I’m so sorry to hear you’ve been sick, too. I know where I caught mine, and it was from a friend who should have stayed home! It’s been a slow recovery. I think the secret is to continue to baby yourself, even after you are feeling better. I went back to work too soon. I love Mexican food (and drink) and this table really captures the feel of Mexico. 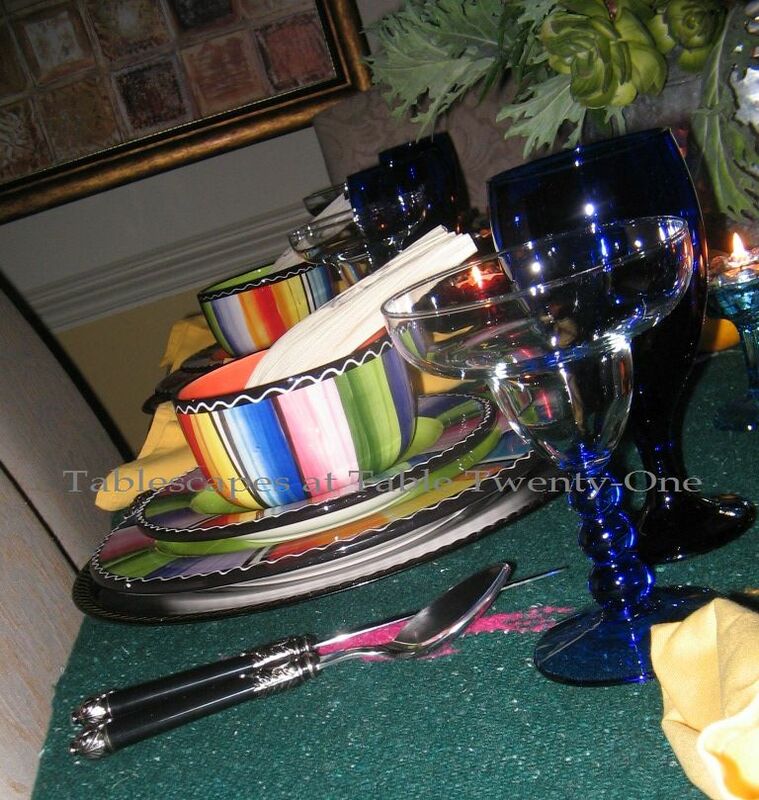 LOVE those colorful dishes and the flatware is perfect! I came so close to buying a set just like them at Tuesday Morning about two hours ago! Ornamental peppers are one of my favorite plants. They just make me smile! All the elements come together so beautifully, and your Aztec calendar looks happy to be included. Muy linda, mi amiga! I love the southwest/Mexican look ! One of my favs ! Good job as usual ! Sorry your still sick! You didn’t do what the doctor ordered!! This is a fun tablescape! Love all the vibrant colors and your blanket from Tijuana is perfect for the occasion! I bet it was a fun dinner! 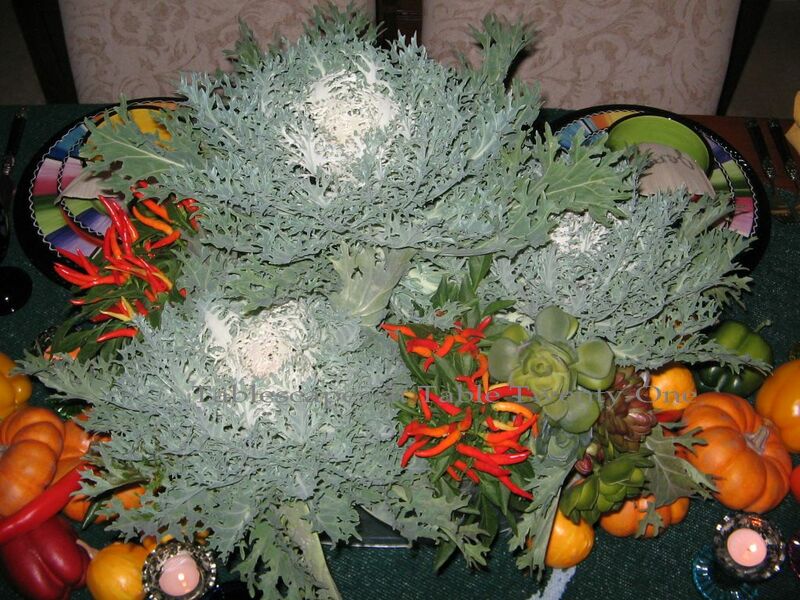 Great job on the centerpiece- I like the mix of the kale and the peppers! 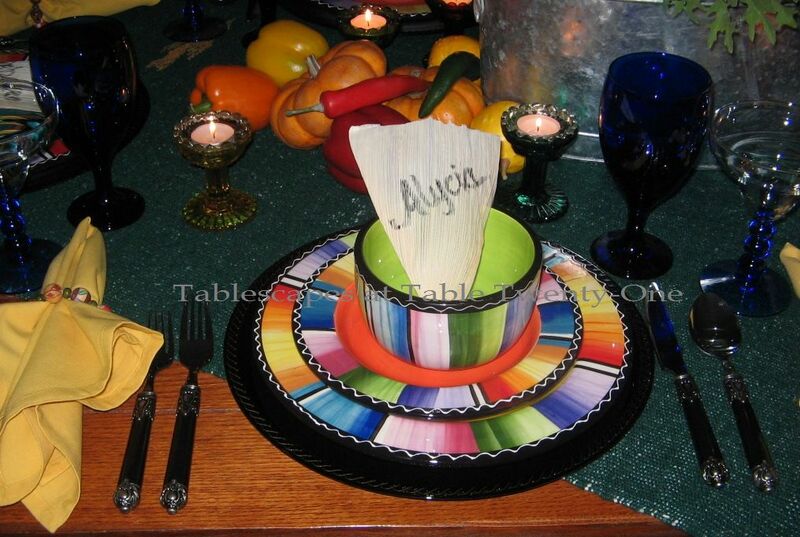 Your corn husk place cards are too cute- what a fun idea! I can’t read that calendar!! Help!! That flatware looks like it’s home was in my recreation room? It added to the flare of the tablescape, otherwise I’d ask that it finds its way back home. Sorry you are so sick. Hope you are feeling better soon! I know what you mean about the shopping cart… I hate having to put Jackson in the seat, but can’t chase him all over the store either! Ha! Your table is lovely. 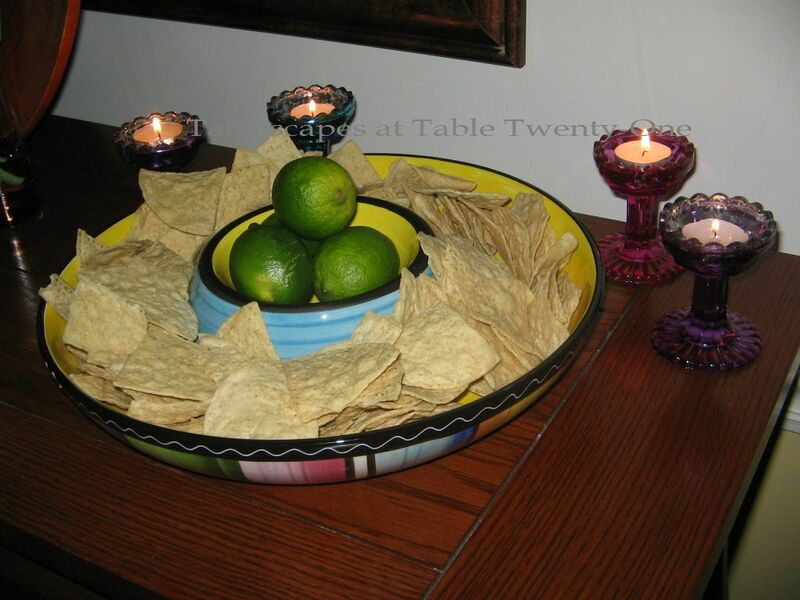 Iove all of the colors in those dishes and that chip n’ dip looks like a great big sombrero! Love it. Have a great week and feel better soon. I am crazy about your dishes! Anything really colorful has my name all over it. You did a fantastic job putting this table together, and I wish I had one of those margaritas right NOW! Very creative, Alycia…love all those bright, happy colors! Your centerpiece is awesome, too. How fun to get to share the preparations AND the meal with good friends. Yesterday, at the store, three different people who waited on my were ALL complaining that they were sick. STAY HOME, PEOPLE!!!! Stop spreading your germs around. Grrrrr!! What a festive setting! I love your centerpiece. I couldn’t pull this off if I was sick!! Hope you feel better! How festive! 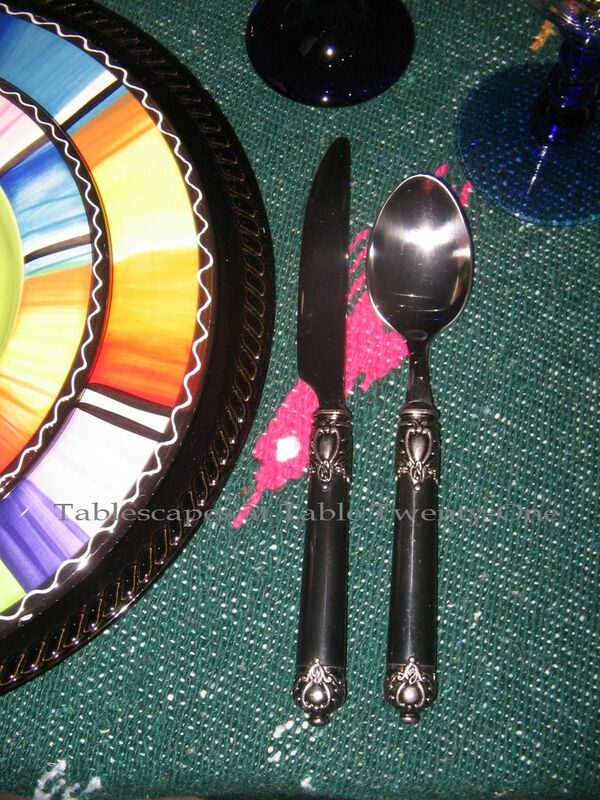 I’m hacking and coughing as well — I’m only half through my tablescape ….and I just quit. I’m off to bed in just a few minutes. 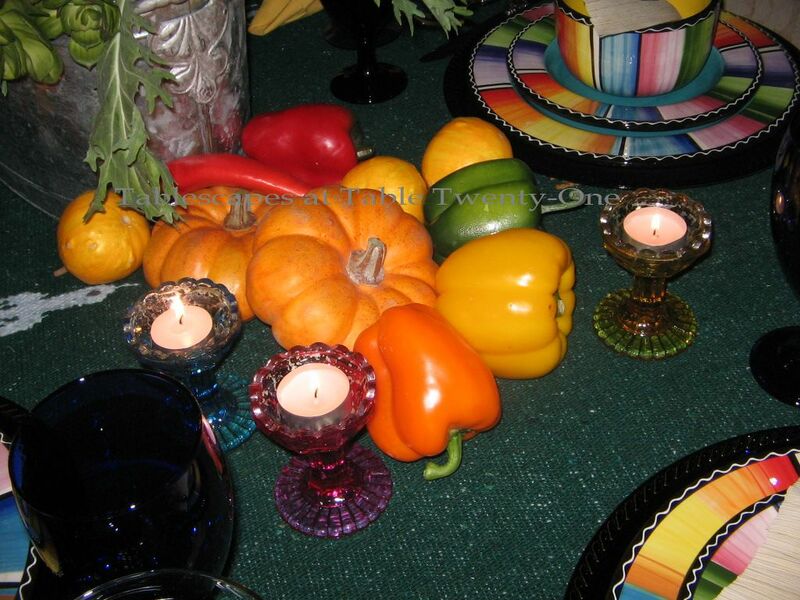 What a fun and colorful Mexican table. Very festive and cheerful. I hope that you will soon be feeling better. Ole! What a fun table – I love those dishes! I know you had a fun girls’ night. Feel better soon! So sorry to hear you are ill. I know what that is like. Your table is gorgeous as usual. Love the colorful dishes. I just had a molar pulled no fun but feeling better now. I hope you get better quick. Oh, Senora! I’ll have one of those margaritas, por favore! (Can you tell I never took Spanish?) What a special treat amongst all of the orange and brown Thanksgiving posts to see this super duper Mexican dinner. I wish I could click my castinettes and make you feel better! Take care of yourself! Alycia, you couldn’t have a prettier set of Mexican inspired dishes. Yes, they look just like a serape! I would love this set and would be having Mexican parties all of the time! Love the serving dish too and those wonderful candle holders. Oh, the wonder of gorgeous dishes. This one just makes me feel like going out for mexican food. Love your colors! Very neat! 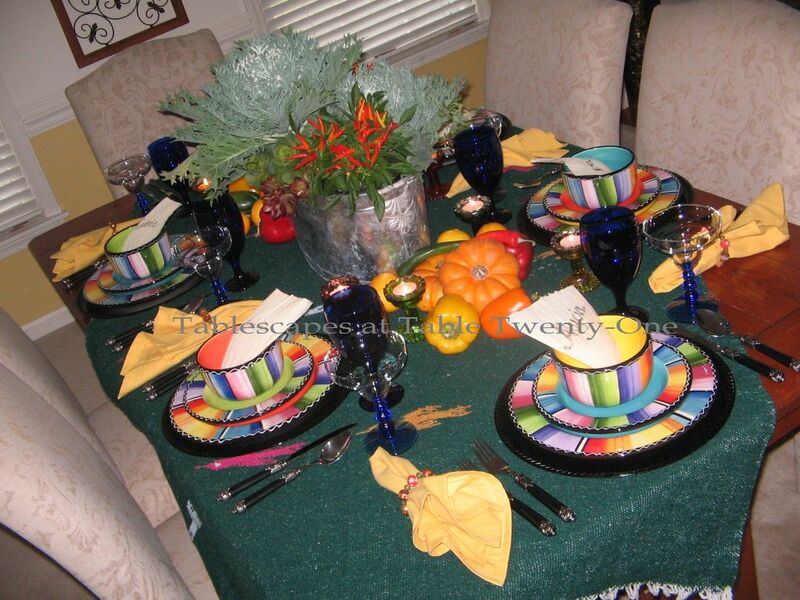 I ♥♥♥ this vibrant table…those dishes are fabulous! 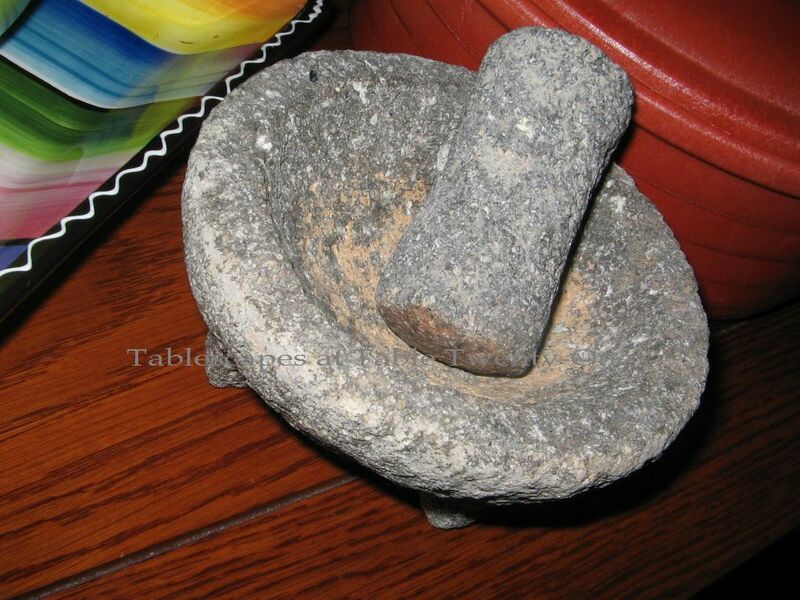 You even have a molcajete…I used to use mine all the time when I made guacamole. Thanks for sharing this fun table, Alycia! Sorry your not feeling well! But you still pulled off another great tablescape! I didn’t have a chance to do one this week ;-( I’m sure you had a fun dinner! Great job on the centerpiece. Hi Alycia, I hope you are feeling better now. You need to rest up and take care of yourself. Your table is so colorful and fun. I love the Fiesta theme. I loved the warmth of it, Those dishes from TM are fabulous, and the cobalt glasses from Pier One were a perfect choice to bring out all those shades of blue in them. My favorite part of all? It was the corn husk place cards. I just love the way you work a theme so beautifully. I know I’ve said it before, but that’s my favorite thing about your tables. You are so creative! This is a super tablescape! I love the colorful dishes. This table is really AMAZING!! I love it, even more so because I’m not creative enough to have come up with this myself. 🙂 I love your rug from Tijuana, and those colorful dishes are so pretty! Your San Remo flatware looks great, again. BTW, I found my off-white flatware. I got the Argent “Sophia” at Target. I tried to e-mail you last week to tell you that Target had it and also Horchow had it on sale. But I couldn’t find your correct e-mail address until this evening. Anyhoo, I also love your centerpiece, the margarita pitcher and the Aztec calendar. Awesome! Thanks for your sweet comments on my tablescape. I’m slow getting back to you because I’ve been sooo tired this week. The time change gets me every year. I’m really sorry you’ve been sick. Don’t let it turn into pneumonia again this time, okay? Take care. OMG Alycia, a respirator machine???!!!!! Goddness, you were so sick, I can’t wait til you feel your old self again girl friend!! Thanks darling for taking the time to write me a note so lovely and generous. I am American from Astoria-Queens, NY and I do celebrate the sat. after because there’s no Thanksgiving here. I do with my family and American friends, sometimes I host or they do, so it’s great! Please take care and let us know when you feel terrific, I’ll be sanding prayers your way sweet lady. Lots of hugs. Hi darling, I sure hope you’re feeling better. I’m so sorry you’ve been sick..You’re right sure didn’t need you here with all of that going on.. I am sorry you missed all the activity. Day 2 is over and the shop is a lot “less” full.. Now is that good English? I don’t think so…. lol.. I do hope you make it over at some point… would truly love to meet you!! Oh my – that table is great! 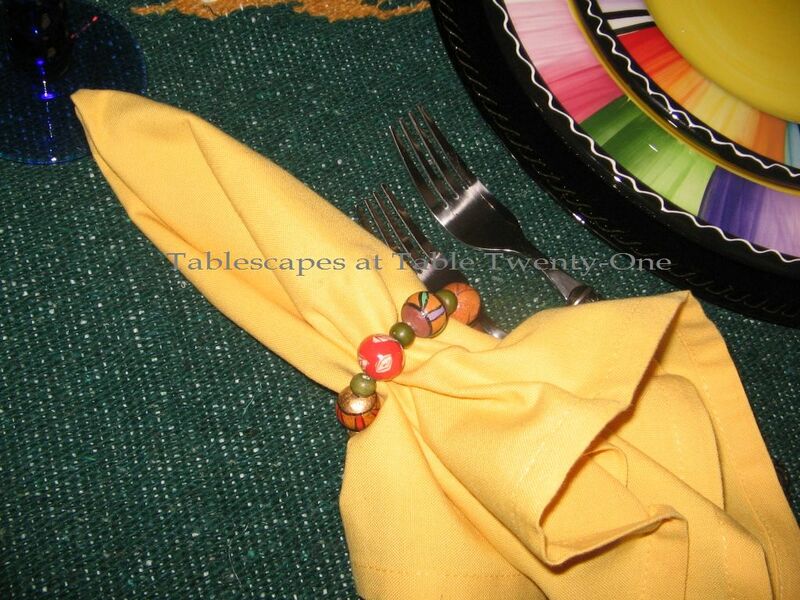 I LOVE the centerpiece and those dishes and using the corn husk as a place card…genius! I missed you all so much I was ill and we had a bank holiday in between just managed to look at all your lovely posts. Thank you for visiting me and for your wonderful words. Loved all your posts that I missed check through, I am definitaley dying for these dishes bring light in to my life. I’m late to visit this week as this is transition time between Maine and Houston so I haven’t spent much time at the computer. 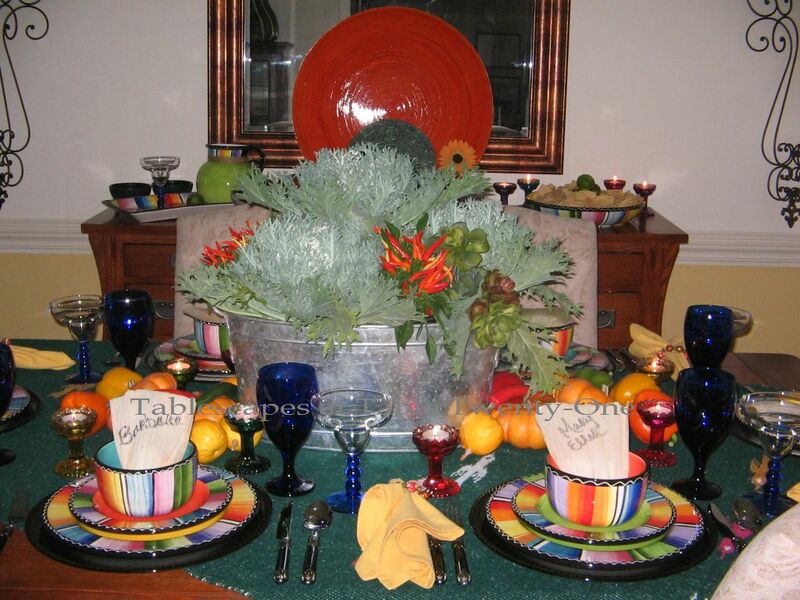 Love your table, the colors and, of course, the southwestern theme. 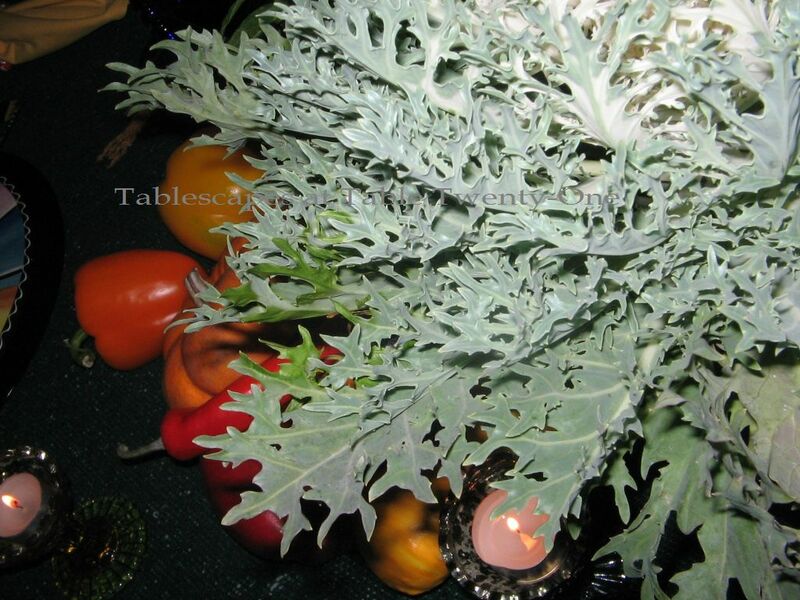 Using kale in the centerpiece is terrific, a graceful complement to the straight edges. Hope you are feeling better. Do take care. Laughing only cuz I am sick with the “junk” myself as I am reading this. Yep, those carts need to be taken outside and hosed down like they hose down the bathrooms with hot water occasionally. Imagine what is living on them (never mind don’t). Missed this one, when I was on a sort of hiatus. This is beautiful, as always, Alycia! Hi Alycia~ I’m late visiting, I’ve been out-of-town. 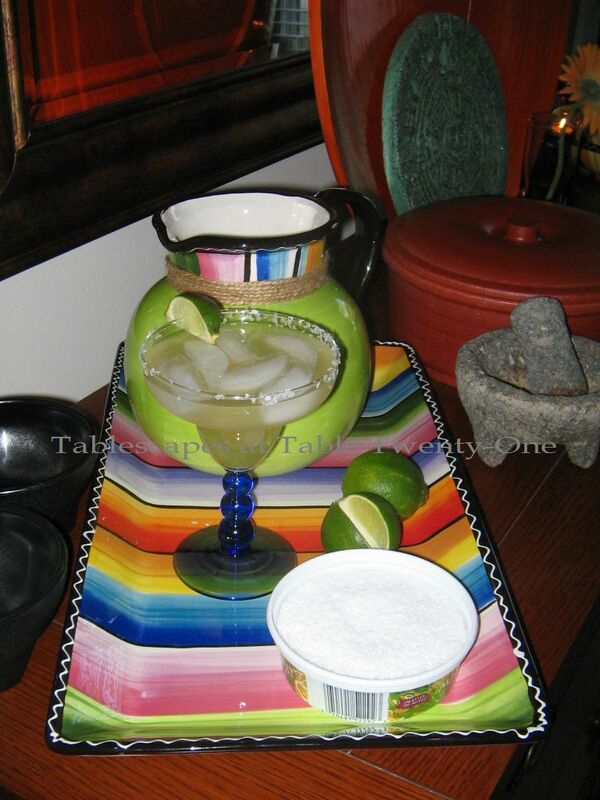 Hopefully now you are recovered, a margarita or two is probably just what the doctor ordered 🙂 Love your colorful dishes and what fun to have a neighbor/friend to pool your resources and have a girl’s night in! I wish I had someone to share a dish pantry with and swap & borrow from!